A sawfish's snout is a long, flat blade that has about 20 teeth on either side. This snout may be used to catch fish, and also has electroreceptors to detect passing prey. Sawfish is elasmobranchs, which are fish that have a skeleton made of cartilage. They are part of the group that contains sharks, skates, and rays. There are over 1,000 species of elasmobranchs. Sawfishes are in the family Pristidae, a word which comes from the Greek word for "saw." The NOAA website refers to them as "modified rays with a shark-like body." There is some debate over the number of sawfish species that exist, especially since sawfish is relatively understudied. According to the World Register of Marine Species, there are four species of sawfish. The large tooth sawfish and the smalltooth sawfish occur in the U.S.
Sawfish can reach lengths over 20 feet. The smalltooth sawfish might have small teeth, but can be quite long. According to NOAA, the maximum length of a smalltooth sawfish is 25 feet. 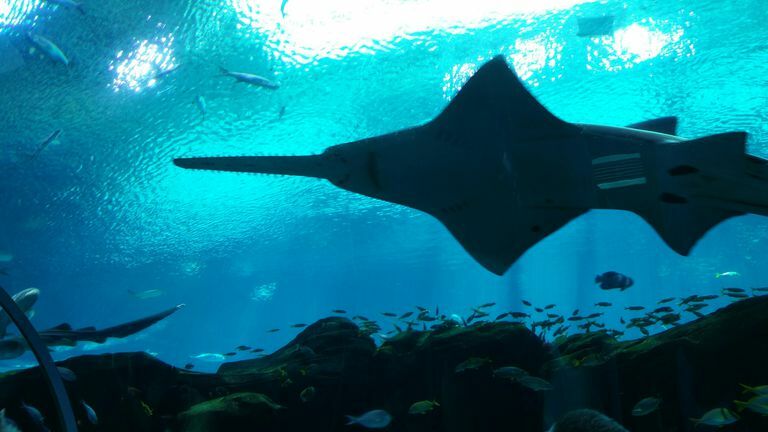 The green sawfish, which lives off Africa, Asia, and Australia, can reach about 24 feet. There appears to be a lack of reliable data on sawfish populations, but NOAA estimates that populations of smalltooth sawfish have declined by 95 percent or more, and large tooth sawfish has declined even more dramatically. Threats to sawfish include fishing, bycatch in fishing gear and habitat loss due to development; the latter particularly affects juveniles who seek shelter in vegetation in shallow water.